"Just read the newspaper. Managing risk is more critical today than ever before. There is one risk you should take buy this book!" "This is a must–read for every manager who wants to reduce risk. This how–to book is filled with sound and practical advice and prepares you for today′s rapidly changing financial world." "Practical and compelling, Dickstein and Flast finally bring together important concepts that through their framework become actionable for every organization. This is a book grounded with examples that business leaders can use. Truly No Excuses!" Ready for Real–World Operational Risk Management? 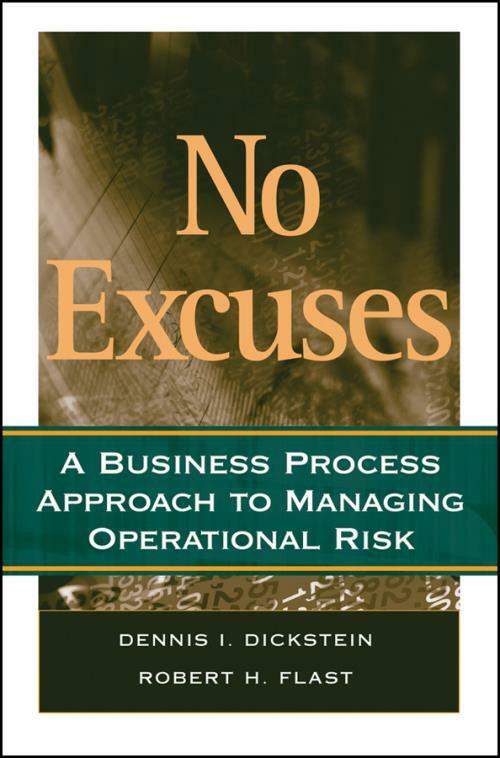 No Excuses: A Business Process Approach to Managing Operational Risk recognizes operational risk management as a tool to help leaders at all levels in all organizations to proactively manage risks. Practical and no–nonsense in approach, this guide is written with a unique focus on integrating business process management with operational risk management to equip your organization to realize that there are no excuses when it comes to managing operational risk and business processes. Part One: Where We Are Now. Chapter 1 Surviving a Series of Unfortunate Events. Another View of the Barings Collapse. A Story Closer to Home. The Firefighter and the Fire Marshal. Chapter 2 What Is Operational Risk? Operational Risk = Unexpected Risk. Principles of Operational Risk Management. New Framework for Operational Risk Management. Chapter 3 What Is Business Process Management? A Study in Green, Gold, and Platinum. Enhanced Business Process Management Cycle. Part Two: Where We Want To Be. Chapter 4 Integrating Process and Risk Frameworks: Prologue. Overview of the Integrated Model. Chapter 5 Aligning Risk Appetite with Business Goals. Famous for the Wrong Reason. Famous for the Right Reason. Activities of Setting Business Objectives. Activities of Setting Risk Objectives. Activities of Designing or Redesigning Business Processes. Chapter 6 Determining Potential Risk of Business Processes. Activities of Determining Potential Risk. Tools for Identifying Potential Risk. Chapter 7 Monitoring Process and Risk. Activities of Ongoing Business Process Monitoring. Activities of Ongoing Operational Risk Monitoring. Numbers Are Not Always Necessary. Chapter 8 Active Risk and Process Management. Activities of Managing Operational Risks. Managing Risk while Managing Processes: An Integrated Framework. Chapter 9 Integrating Process and Risk Frameworks: Epilogue. Part Three: How We Get There. Chapter 10 Role of Technology. Technology as Part of the Problem. IT Tools for Managing Business Risks and Processes. Chapter 11 Role of Outsourcing and Offshoring. Origins of Outsourcing and Offshoring. Risks of Outsourcing and Offshoring. Chapter 12 Role of Organizations. Organization as a Source of Risk. Responsibilities of a Risk Unit. Chapter 13 Role of Corporate Governance. Chapter 14 Changing Corporate Culture. People Who Work in Glass Houses . . . .
Getting There Can Be Tough. Chapter 15 Preventing Another Series of Unfortunate Events. Another Crime of the Century? Get It Done on Your Own or With Help.